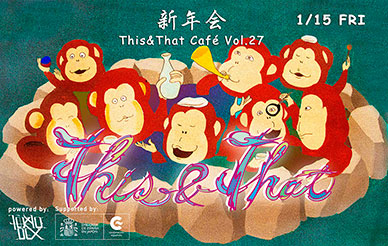 Once again TokyoDex christens the New Year with our flagship event “This&That Café” at SuperDeluxe. The 2016 cast features a rare combination of analog and digital delights that could only be described as an embarrassment of riches. From the Reggae-Soul-Flamenco stylings of Shamanz, to the bold pop-art strokes of Luise Ono’s live painting, #TnTCafe vol.27 promises to take you on a deeply artistic multi-sensory journey. Not to be missed! Hyperpotamus is a London-based multi-vocal solo artist from Madrid, Spain. He makes music using only his voice, a few microphones and a loop pedal. His music layers his own vocal rhythms, harmonies, beats and song using a loop pedal, in much like a jigsaw order; often revealing the full orchestration, half way through, on the crescendo of his songs. Intricate syncopated rhythms, hypnotic vocal harmonies, raps and beatbox pulses all come together to weave a unique musical tapestry that often mixes languages in response to both his Catalan and London influences. Name is Sam. Samuel. Sammy. Bazl Whammy. Elu Sari. Sami Elu. Sammy L I invented this thing called the chopstick piano. I play music on it. I like it a lot when kids join in with me, and I encourage little ones to get a groove on. With the loving help and support from my peoples, my life mission is to use what resources I have to continue the ever-infinitely cycling creative process, build more sound machines, twine more melodies, and get bigger and bigger groups of kids (and adult kids) together to join in on some ecstatic group biorhythms. Vocalist YUMINGO leads a group of friends who play mostly Jazz in venues across Tokyo. YUMINGO has been a guest at the This&That Cafe since its inception in 2012, and she promises to deliver another stellar performance with this new ensemble. Born in Milan and raised in Johannesburg, Shizuka Nagahama is a multimedia artist who harnesses her distinctive sensibilities and unique expression to create video, illustration and music under the moniker “lazuccalunga.” At This&That Café, she will be projecting a collage of some of the amazing shots she has collected in her world travels, including immersive 360º Spherical photos and videos she took with the revolutionary RICOH THETA-S. Paired with some of the musical guests for the evening, join lazuccalunga on an amazing audio-visual journey that could only happen at #TnTCafe. FireFly creates personalised experiences at events using NFC technology combined with digital art. At this year’s New Year Jam, guests are invited to check-in at stations inside the space to activate projections and become a part of the visual experience at This&That Café. A quick sign-in process on site connects you directly to this interactive installation designed by digital artist Alexis Andre and TokyoDex. The artwork of painter/artist Luise Ono draws from organic patterns, looking to flowers, plants, and nature for inspiration. She has appearing in events as a live-painter since 2010, and had multiple opportunities in store-fronts and offices around Japan to create sprawling installation works. When performing at events she generally works with her partners under the name “MiL”. Together they have appeared in many art and music festivals.